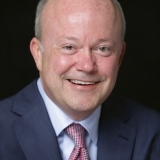 Jim O'Shaunessy is the founder, chairman, and CEO of O'Shaughnessy Asset Management, LLC headquartered in Stamford, Connecticut. He is considered one of America's leading financial experts and a pioneer in quantitative equity analysis. He has made numerous expert appearances on CNBC, CNN, FoxNews and Report on Business Canada. Jim has written four acclaimed books on investing; 1994: Invest Like the Best; 1997: What Works on Wall Street; 1997: How to Retire Rich; 2006: Predicting the Markets of Tomorrow. Prior to running O'Shaughnessy Asset Management, Jim worked at Bear Stearns Asset Management as a Senior Managing Director and the executive director of Systematic Equity. He created Netfolio in 1999, a company that offered individual investors the ability to build their own diversified portfolio over the internet. In 1997 he launched RBC O'Shaughnessy mutual funds at Royal Bank of Canada for Canadian investors. Jim is passionate about his relationship with Lincoln Center in NYC, and he hopes to continue to expand his philanthropic efforts. He is excited to join Bristol and network with other executives and professionals.